In briefest terms, the approach consists in differencing the sea level time series from a tide gauge with an equivalent time series from satellite altimetry. To the extent that both instruments measure identical ocean signals, their difference is a proxy for the vertical position of the tide gauge. Assuming that the instrumental drifts are negligible, the time series of the sea level differences will then be dominated by vertical land motion at the tide gauge. This is illustrated in the figure on the right (click on the image to enlarge). It is essential that the processing of both data types be as consistent as possible too. For instance, since an atmospheric correction is typically applied to satellite altimetry data, we applied the identical correction to the tide-gauge data. The details of the atmospheric corrections and their accuracies are not relevant here, since common errors will cancel in the differentiation. It is the consistency of models and corrections applied to both datasets that must be ensured. All tide gauge data used in our calculations are from the Revised Local Reference (or ’RLR’) dataset of the PSMSL. We selected tide gauges with more than 15 years and a minimum of 70% of valid monthly mean sea levels over the satellite altimetry period, starting in 1993.0. We used time series of satellite altimetry mean sea level anomalies (SLA), i.e., sea surface heights with respect to an arbitrary temporal mean (it can be different from one provider to the other), whose primary raison d’être is to avoid large numerical values (decametric ellipsoidal heights with regard to the expected centimeter level changes in mean sea levels). Note that we considered satellite altimetry data from several data suppliers. Here, we are dealing with the data set identified as Global MSLA heights in delayed time ("all sat merged") from the Archiving, Validation, and Interpretation of Satellite Oceanographic data (AVISO; http://www.aviso.altimetry.fr/en/data.html). The temporal sampling was homogenized to time series of monthly data. Time series of sea level differences (SLD) between monthly tide gauge and satellite altimetry data were built using three variants of satellite SLA time series, namely the closest grid point, the most correlated grid point, and the average within a 1° radius from the tide gauge location. However, since the differences between these variants were negligible, we adopted the SLA averaged within a radius of 1° around the tide gauge location. Once computed, the time series of sea level differences (SLD) were checked visually to discard those that displayed clear non linear behaviour, i.e., for which vertical land motion would not be adequately modelled by a linear trend. We then estimated the linear trend of the de-seasoned and de-trended SLD time series. All quoted uncertainties represent 1-sigma standard errors. We plan to update the calculations of the sea level differences on a yearly basis, because as the time series lengthen and the satellite providers improve their products (new models, corrections, algorithms...), some level of improved precision is expected. 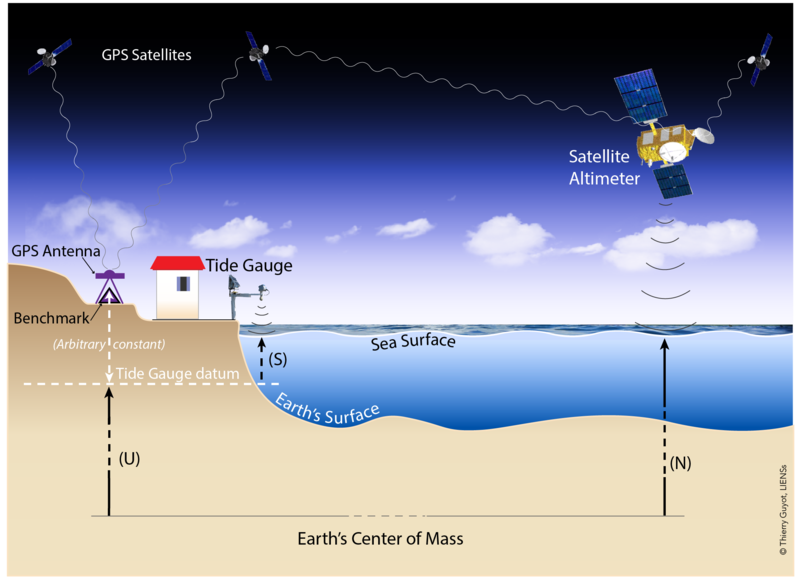 However, there can be real differences between sea levels measured by a tide gauge at the coast and that measured off-shore by a satellite altimeter, due to the ocean processes which occur between the two points. This could be interesting to investigate and monitor. By contrast, for most open ocean locations, there is usually a high degree of correlation between variability in the two types of sea level. In this case, the vertical land motion can be estimated, provided the instrumental drifts are negligible. If there are (drifts), it enables tide gauge data to be used as a check on the satellite altimeter information and its stability and, conversely, it enables gross errors in tide gauge datum to be identified.